Reviews | Regal Ground Cinnamon - 5 lb. Regal Ground Cinnamon - 5 lb. An essential spice for any kitchen, Regal ground cinnamon adds an earthy, familiar flavor to baked goods, curries, dessert sauces, applesauce, and beverages! Reddish brown in color, this woody, earthy flavor is warming to taste. The finer the grind, the more quickly cinnamon is perceived by the taste buds. One of the oldest known spices, cinnamon is derived from the dried inner bark of a tropical cassia tree. We purchased this cinnamon for our coffee shop. It smells and taste great and received no complaints at all. For its price and size, this cannot be beaten. We use this cinnamon in our bakery. Although I'm not a cinnamon snob, this stuff really tastes great to me and the staff. We have never had any complaints. I use this cinnamon in everything from spice blends to cinnamon rolls and king cakes! It works great in all of our retail spice blends and baked goods. Not all cinnamon is the same. You can tell a good cinnamona by a sweet smell. This cinnamon was exactly was I was looking for at a great price. Love when I get an order because the spices always taste and smell so fresh! I know that whatever I am making, it will have that fresh flavor I expect. We purchased the smaller container but now purchase this bulk container since we love it so much! This is great quality cinnamon that we use in our bakery on a daily basis. Always smooth & consistent in flavor. The only cinnamon we purchase now. Cinnamon is very fine. Flavor is great. Little goes a long way with this cinnamon. Definitely recommend using this ground cinnamon for all cooking baking needs. Great produc overall. Ships fast and comes in a sturdy container. Tastes great in our carrot cakes and cinnamon sugar toast. Will definitely order again! I love the regal brand seasonings! The cinnamon tastes great on our French Toast! I love the larger quantity as well. Highly recommend this product! We use cinnamon for our holiday ice cream flavors. This did not disappoint and for the price you can't say no! Will definitely purchase again. Regal Ground Cinnamon has good texture, aroma and color. You can see, smell and taste the quality. It's easy to use packaging makes handling and measuring a breeze. It makes my gingerbread smell fantastic while baking and tastes great. Regal Cinnamon for the winnamon! This cinnamon is well ground and works in all kinds of recipes. It’s also a great topping for a perfectly steamed chai latte. What can I say about ground cinnamon. I use it at my coffee shop for multiple recipes and for my customers to use in a shaker. no complaints at all, taste is great and container size works for me. In catering you want to have items on hand so you won't have to order every day or every other day. Worst of all you don't want to keep running back and forth to the store. Great cinnamon flavor in an easy to use container. The canister keeps the spices fresh in between uses. We will continue to purchase this item for our baking needs. Regal ground cinnamon is great. It doesn’t clump and is always as finely ground as it was upon arrival. It is perfect to refill small shakers. I love getting spices from Webstaurant. Not only are they extremely less expensive than getting them from my food distributor, but they save me from having to go to the large bulk store and still having to pay more. Exactly what I needed! The cinnamon works great for using in our gourmet popcorn. It's also the best price! Anywhere else I searched was far more expensive. This cinnamon is a great value! It's a must have for any baker that uses a lot of cinnamon. The quality and price is amazing! I don't know if I was more surprised with the price I paid for this, or the quality of it. I couldn't tell the difference between this and other higher priced brands. It is definitely worth the price. You might think that all cinnamon tastes the same, but this ground cinnamon has a touch of freshness added to it. It is a great ingredient to have on hand and works well to make cinnamon sugar. Such a great price on such a large portion of ground cinnamon. Definitely worth the money spent. I would not buy this product anywhere else! Cinnamon is cinnamon to me but this price is really a great value. Like many webstaurant products this price can not be beat anywhere locally or online. Great product. Great pricing on all of Regal spices. We use cinnamon for our Homemade Cinnamon Rolls and our Famous French Toasts. The quality of the ground cinnamon is great. The ground cinnamon is perfect for baking and is so aromatic and smells wonderful. The cinnamon is a great quality and excellent for sweetening pies and oatmeal. It is my understanding that Cinnamon will lower your blood sugar and this Regal Ground Cinnamon has a wonderful taste and is also Healthy for all of us. This Regal Ground Cinnamon tastes great, It is very convenient to have the handle integrated in the bottle to help control pouring volume. Item as described. will reorder. I bake cinnamon rolls for orders and farmer's market. The quality and price make this product a staple in my certified kitchen. The large container and its large mouth facilitate scooping out the quantities of cinnamon that I need. We use a ton of cinnamon in our kitchen, and being able to buy it in bulk saves us time and money, which is always good! I like this brand of ground cinnamon. It is a great deal per ounce compared to smaller containers in the stores. I use it to mix with sugar, and it mixes very well. I highly recommend this product, and I will be purchasing it again. We have been making bagels with another brand, then changed to this brand. It has a very odd smell, almost chemical, I would return it if I could to get another sample to see if this was a bad batch. Just got another brand and it has the good cinnamon smell. So I can not use this brand. Large size. Great value. The product tastes good. Because of its health benefits we use it on a regular basis with chocolate, oatmeal and desserts. We also use it to make lots of cinnamon cookies for party meetings. We will be ordering more and more. Our best selling spread is our cinnamon sugar and it goes great with any of our sweet bagels. Love this fresh cinnamon and the perfect taste. A great value! This cinnamon tastes great and works well for all of our recipes. With an easy pour spout is helpful OR you can just unscrew the lid and use it that way. I go through cinnamon super fast with my baking business.. the tiny containers from the supermarket don’t cut it. I love this 5 pound container.. plenty of product to go around while still being easy to manage and store. The containers are nice and can be re used for a variety of purposes after you’ve finished the product. High quality, delicious tasting cinnamon. Very fine! Will be buying again when I run out. Regal ground cinnamon has a great flavor. It’s crszy that we go through a lot of cinamon but the freshness seems to last. We even store it in the fridge. This is a great tasting and smelling ground cinnamon in a container that holds up after extended use. We'll definitely be buying these again when the time comes around. We love using this spice in our smoothies. The taste is superior and the quality is fantastic. without using a large quantity you are exposed to the flavour of the product. We love that we can purchase bulk spices from Webstaurant! We use cinnamon a lot in our drink recipes, so it is nice to have a large amount on hand. You can't beat this price. All of these spices, including this cinnamon, from Regal cannot be beat! They are of equal or better quality that most of the private labels, or national brands, and are only a fraction of the price. Good quality ground cinnamon! We love to be able to order herbs and spices through Webstaurant! Will continue to order this product as stock gets low! The regal cinnamon is delicious and the price for five pounds bulk is great. We use a lot of cinnamon in our baking and this is the best way to purchase. The regal ground cinnamon is so fresh. i love the bold scent right when the lid comes off. A great spice for making our cinnamon pear preserves. A really nice quality cinnamon. The cinnamon smells and tastes really great. Perfect in our tea or oatmeal. 5 pounds is great for our usage. A great bulk container buy from Regal that is a great quality and perfect for our kitchen. The cinnamon is bold and fragrant and great for holiday baking. A very pungent and bold style ground cinnamon that is a great spice to keep on hand for baking. The cinnamon is great for making our simmer pot fragrance blends. The price is great as well. My friends and I do a ton of baking during the holidays. We decided to purchase the Regal ground cinnamon 5 lb. container and we were very happy that we did. After all the days of baking goods for the nursing homes around our area we had enough of this high quality spice to keep for ourselves. Great purchase! THE Regal Ground Cinnamon - 5 lb. IS REALLY WONDERFUL TO HAVE IN A BUSY BAKING KITCHEN. IT COMES IN A BIG. EASY GRIP CONTAINER WITH NICE DISPENSING SPOUT. SUPERB TASTE AND SUPERB QUALITY SPICE. GREAT PRICE TOO! Great product! Has great flavor. Very good price! Use it for my cinnamon sugar items. Twist, apple filled donuts and of course Apple fritters! Highly recommend! If you use cinnamon this is a great deal. The quality is great and fragrant. We use this for everything from drinks to baked goods. Excellent value and product. This is the perfect solution for bakers. Lots of cinnamon for an affordable price. It gives you a reason to make cinnamon rolls and spice cake. A really nice quality spice from a great brand. It is very pungent and flavorful and goes great in a variety of dishes. I love the large container with great handle for easy handling. A nice bulk container of ground cinnamon. The perfect ingredient in making our house made cinnamon honey butter. The cinnamon is a great quality and smells amazing. Every baker needs a ton of cinnamon in their pantry and this value fits the bill. You can use it in sweet or savory dishes, in fact, mole is great with cinnamon. We use this product daily, it last a long time and is perfect for our restaurant. I would recommend this product, it is a great size and cost. I love buying this regal ground cinnamon in this quantity. It is so fresh and has the best taste and smell. Love using it in cookie recipes and on my oatmeal! We love this cinnamon in our restaurant. The price is better than we have found anywhere else and it lasts so much longer than the small containers. This is seriously an amazing deal on this amount of cinnamon. I use cinnamon almost every day in my oatmeal for breakfast and in a lot of baked goods. We purchased this for use in our homemade dog treats. The cinnamon has a strong, healthy scent and tastes very fresh. Will reorder when we run out. Excellent value for the money! Shipped promptly and received in a timely manner. Product received in excellent condition. I wish the shipping cost was less, but factored in with the cost savings it's still cheaper. This Cinnamon lasts a very long time- but during the fall time, we go through the 5lbs about every 2 months. This is a very good price, and quality is top notch! This should be on our reorder- because of the quality of the cinnamon and the price for this in bulk is so very inexpensive. Regal is a great brand for spices! I am very impressed with the quality of this cinnamon. The color is rich and the flavor is wonderful. Easily better than anything I have purchased locally. love this cinnamon. 5 lbs is a lot . try putting about 1/2 tsp when you brew your coffee. so good! i also use it cuz I make my own granola. This is a LOT of cinnamon so you may not want it if you dont use a lot. but per oz it is a great value. Also the moment I opened it I could tell it smelled so great! Maybe because it is fresher? I dont know but there is a noticable difference in what i buy at the grocery store. I am very pleased with the quality of this cinnamon. I was apprehensive when buying in large bulk, but was pleasantly surprised! Highly recommend it. I can never have too much cinnamon spice. I quickly go through it. I like to bake spice cakes and cookies and eat this as is on warmed apples, yum. I have ordered ground cinnamon from my wholesaler before at twice the price. I was so pleased when I found this and even happier with the quality for the price listed! Perfectly ground aromatic cinnamon. Not too pungent, and adds wonderful flavor to baked recipes. Offered in a 5 lb container allows for consistent flavor in baked goods! Pretty good cinnamon for the price! We use it in our Cinnamon Kane granola. I noticed that the newer bottles have a fliptop cap with holes for sprinkling. We buy all of our spices from webstaurant either in the 5# container or in bulk. We've never been disappointed. The cinnamon has good aroma and a nice strong flavor. This is enough cinnamon to last a very long time I highly recommend that you buy this the flavor was amazing and the price was just as good . This is an excellent tasting cinnamon! The economical size is a plus! Quality has not been spared for price! Highly recommend this for anyone's baking needs! After shopping around, I found out this was the best price for this product. Good product for the price. I would recommend this product for sure. This cinnamon powder is slightly darker than I'm used to but the flavor is just as powerful as other quality brands that I've used. It's very rich and tastes great in every dish that I've used it in. I would suggest using less than your recipe calls for, as it's very strong and rich in color. This spice is very fresh and strong. I am using it to make cinnamon toast and also for french toast. I am very surprised to see how many different cultures from around the world have never tasted cinnamon and usually don't like it on the first few tries! This cinnamon is delicious and great in recipes. We use it in oatmeal and in sauces, desserts, and more! Sprinkle some on top of ice cream or code for added flavor! We use Regal Cinnamon in all of our cafes for our lattes and custom made syrups. Customers really enjoy the drinks and the offer for more cinnamon on top is rarely turned down. The Regal Ground Cinnamon is an excellent product at an excellent price. We use it to make a cinnamon-sugar topping for our donuts and they're a hit! Great quality cinnamon,very fresh and fragrant with amazing awesome price. It came in 5 lb vacuumed sealed container with a handle, very easy to store,stack and pour into shaker container. I love it ,no mess like the previous 1 lb bag cinnamon I bought from another website. The container also keeps the rest of the cinnamon fresh. We go through cinnamon like water around here. We use this for our cappuccinos, cinnamon raisin bagels, cookies and muffins. The price is fantastic and we love the stay fresh packaging. Interesting product. I have ordered this twice now. I'm pretty sure it's a blend of different types of cinnamon because the first time it was a little sweeter/lighter and the 2nd time it was heavier,darker and more bold tasting. Also, the 2nd version does not mix as well but good nonetheless. Either way it beats any other cinnamon for the price! I always panic about running out of cinnamon. This 5 lb container has been wonderful! I've hardly put a dent in it. The price was great and it tastes good and strong. Will order again in the future. Adds Great aroma and flavor to my preparations. Great price ! Transferred some to a small container for regular use. My crab curry smells fantastic with Regal ground cinnamon. This meets and exceeds my needs for baking of all kinds. I use it often in my quick breads. I even made a nice cinnamon whip cream for a apple butter pumpkin pie that was a big hit. Regal Ground Cinnamon is a great product with a very good flavor. Pricing for the bulk container a great value, way less expensive than buying in small containers. We use a lot of cinnamon and we are very happy with this product. It is as good as any we have gotten and the pricing is so much better than our previous supplier we are very happy. Great product and the perfect size if you do a lot of baking. Usually I use this as the main receptacle and transfer into a smaller shaker to keep the product fresh. We use this Cinnamon in four of our best selling recipes and we LOVE the taste! It is fresh and a beautiful color. I HIGHLY suggest this cinnamon over any of the other garbage you would think to order. The Regal Cinnamon is the BEST we have found!! Needed bulk cinnamon for cooking in my store and was sick of buying small containers of it. This most definitely does the job, tastes great and is a very reasonable price! One of the best that I have found and it' very cheap compared to store brands. I will use this all the time where I make many things from cinnamon. 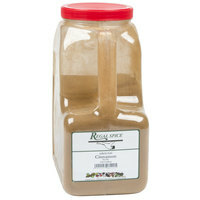 the ground cinnamon is what i always want to purchase from Webstaurantsotre because i like to bake with ground cinnamon especially in the winter months. The price is great, one should consider buying. great taste and texture to this cinnamon, however the container it shipped in had a puncture in it, so we had to tape it up to prevent it from spilling. otherwise a great product. Wow! 5 pounds of cinnamon all without having to go to the store 25 times! I love the fact that it's so convenient to have such a big container at my fingertips saving me both time and money! BEST PRICE YOU CAN FIND!! Highly recommend this product, we get all of our seasoning from this website! Top quality and one of the best services, we get all our shipments within just a few days. Started off buying the 8oz bottle if this cinnamon. After making the first muffins with this cinnamon, I knew it was a keeper. Decided to buy in bulk to save money and so I would never run out. Finally, a place to get large quantities of good cinnamon. The Regal Ground Cinnamon is top quality and we are very happy with the results in our baking. This cinnamon is as tasty as any I have used previously. The price on this item is unbeleivably low but the quality is there. Great! What a great product at a great price! I use cinnamon in baking, and I think this may just last me the whole year! I will be back for this one! I bake a ton of Greek desserts and if you know anything about Greek desserts, we utilize a ton of nuts, honey, and of course cinnamon! Buy it in bulk and save, the aroma alone is worth the purchase! Excellent value for someone who uses a lot of cinnamon in cooking and baking. The bottle came sealed and the quality is definitely comparable to those tiny bottles of cinnamon you find in the grocery store for $5-6. The cheapest way for me to purchase cinnamon. I am very happy with the flavor and costs of this.. Using it in many recipes and most of all in Cinnamon Rolls, this has helped keep the cost of my ingredients down so I can offer these baked gems at a good price. Prayers are now answered in this household. My children loves cinnamon pancakes and now we don't have to worry about running out of cinnamon so fast. Spicey! Aromatic! Decadent and so many uses. This Cinnamon is great for good old USA baking and so many others Mediteranian, Arabic, Indian, Native american, Cuban etc. I'm so glad that I was smart enough to try it. We are happy with the Regal Bulk Ground Cinnamon. The quality is very good. The containers are a good size, and we re-use them for mixing. Would recommend. I did not know what to expect when I ordered this but I was pleasantly surprised to see and taste the quality of this cinnamon! I use in on our churros and I am very pleased. First, I must mention the price. It's the best I found anywhere. The cinnamon itself is wonderful, aromatic stuff. The expiry date is in 2016, so i'm good for a couple of years. We go through a lot during holidays and church events. This is such an amazing price for cinnamon and it is good quality. It tastes and smells strong just like cinnamon should taste and smell. Many people only think of cinnamon in it's context with sugary sweets but as other reviewers have said, it can make red meats jump off the plate! We lightly pat our meats with it and it makes a big difference! We specialize in barbecue meals where we make lots of peach and apple cobbler and this is the most important ingredient. This is the best price we have been able to find and the quality is excellent. This cinnamon is great for adding to our desserts. For most of the year it sits on our shelf but come the holidays we go through a container a week. Excellent price too! Love this 5 pounds of cinnamon. use the spice for cooking and baking. Also use to make cookies and even put for flavor in meats.